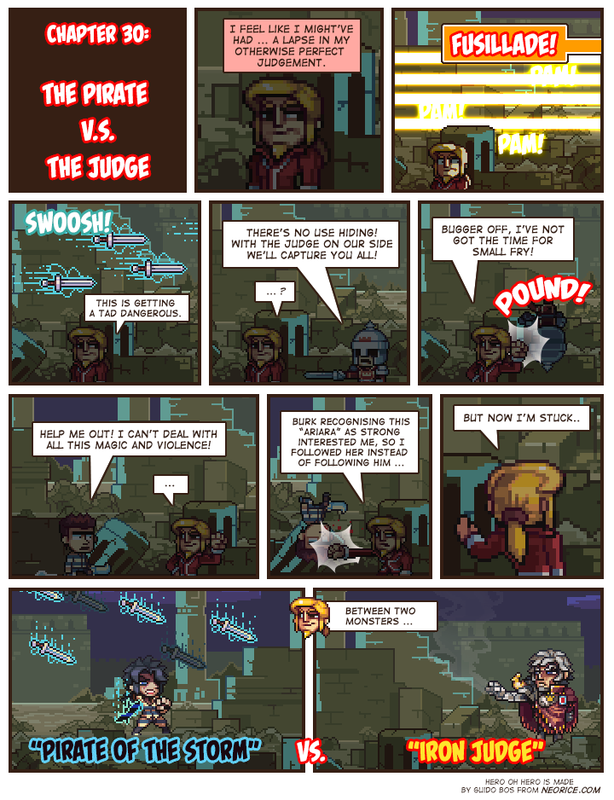 Chapter 30: The Pirate v.s. The Judge. I am very interested in this fight!!! Judge is still wearing his armor I see... pretty surprising considering he seemed to recognize the name "Pirate of the Storm..."
Aristocrat can at least get rid of all lackeys. When the winning side finishes, it will need new lackeys, and that is a chance for the Aristocrat. He will be a sidekick... to a magic hero (or rather a magic villain, because neither Ariara nor Judge seems too heroic to me). Nice use of lighting, m8. They're not in the castle. I had my brightness on low and I didn't see the guard and prisoner standing in the shadows. I thought it was other random people hiding and yelling, lmao. @Saiko: Pfft. Burk will defeat them both. This fight is gonna be so metal! If you remember, before she could take over the General, she had to poke him with one of her swords. I suspect her power has a short range, and must use objects she's already possessing to conduct her power over longer distances. As long as the Judge keeps his distance and blocks her blades with his magic, she can't take control of her. And given that he knows who she is, I'm confident in his ability to do so. I predict Ariara is going to have the Iron Judge on his knees, about to die, when Burk will burst in with the Cutie In Red and beat up Ariara.